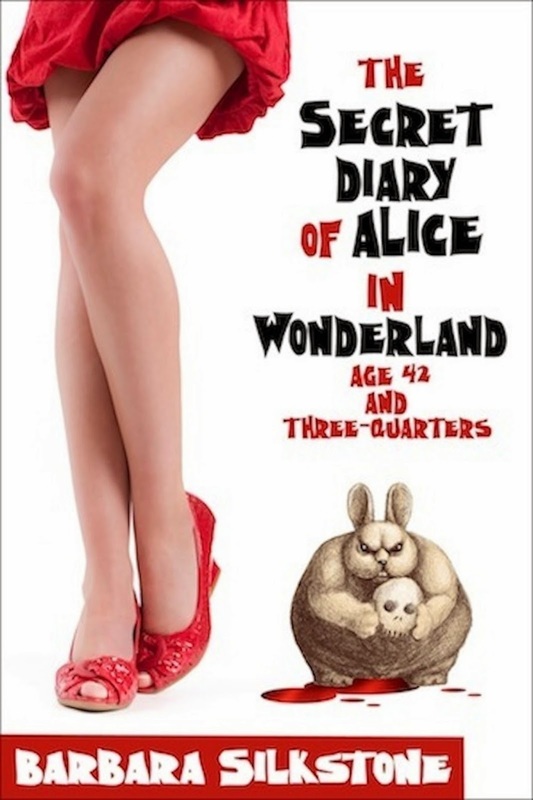 Gerry McCullough's blog – Gerry's Books: Barbara Silkstone talks about her very funny book The Secret Diary of Alice in Wonderland, Age 42 and Three-Quarters. Barbara Silkstone talks about her very funny book The Secret Diary of Alice in Wonderland, Age 42 and Three-Quarters. This is the first book I read by the very witty and exciting writer Barbara Silkstone, and in many ways it is still my favourite, although I love her series about Wendy Darlin. Barbara writes a mixture of comedy and thriller which will keep you on the edge of your chair when you aren't laughing hysterically. Starting today, Monday 27 January, for two days only, Alice is on Countdown Sale, in the UK only, at a greatly reduced figure of 99p instead of its usual price of £3.99. At lunchtime on 28th it moves up to £1.99, then next day it's £3.99 again. So you have a very short window of opportunity to get hold of this book at a ridiculously cheap price. And now I'm going to let Barbara Silkstone talk about her book herself. Take it away, Barbara! What can I tell you about The Secret Diary of Alice in Wonderland, Age 42 and Three-Quarters? The Secret Diary of Alice in Wonderland, Age 42 and Three-Quarters is a comedy thriller in the style of Carl Hiaasen, Janet Evanovich, and with touches of Monty Python. The adventure is inspired by the original Alice in Wonderland but with a totally different adult plot. The story takes place in Miami and London. A murder by beheading sends Alice Harte, reluctant real estate broker for thugs, running into the arms of Nigel Channing, a charming British con man. What, besides Lewis Carroll, was the inspiration for this story? That’s easy. My Cousin Vinnie and a Fish Called Wanda. Also my great love for John Cleese. How to you develop and differentiate your characters? The characters in The Secret Diary just took over the story. From Maris Archer who lives on white wine and laxative biscuits to Algy Green who super-glues his bat wing ears to his head, they took control. I just came along for the ride. Who do you imagine is your ideal reader? What was my journey as a writer? I’ve been trying to carve out writing time since I was in grade school. I started an underground newspaper in 8th grade. The nuns threatened me with excommunication if I kept it up, so I backed down. Over the years I have been fortunate to meet and be encouraged by the likes of Stephen King and James Michener. It was just a matter of deciding that it was too painful to keep putting off writing until the right time came along. There is no right time. A close friend gave me that finally push and then Kindle came along. The planets aligned. I stew on a story until I can’t bear it any longer and then I go into a writing huddle. I emerge to eat and then return to the keyboard. No one ever warns you about how physically taxing writing can be. Neck, shoulder, hands, and bum… all suffer during the intense birthing period. What authors most inspire me? Raymond Chandler, Gabriel Garcia Marquez, Sue Monk Kidd, Janet Evanovich. What book written by someone else do I wish I had written? The Secret Life of Bees. It is a lovely book. Pure joy even as it makes me cry. Barbara Silkstone is the best-selling author of the Wendy Darlin Tomb Raider series that includes: Wendy and the Lost Boys, London Broil, Cairo Caper, Wendy Darlin Tomb Raider Boxed Set. Her Criminally Funny Fables Romantic Suspense series includes: The Secret Diary of Alice in Wonderland, Age 42 and Three-Quarters; Wendy and the Lost Boys; Zo White and the Seven Morphs. For a squirt of paranormal comedy try: Cold Case Morphs. True fiction fan? Try: The Adventures of a Love Investigator. Gerry, Thank you so very much for hosting me today. Alice had a lovely time at tea. And yes, she is only 99 cents in the UK today, January 27th. A pleasure, Barbara! Let's hope you get lots of UK sales! (And, yes, it's 99 pence, not 99 cents! I enjoyed this very much, Gerry. It was great learning more about my good friend, Barbara. Even if she was close to being excommunicated! Glad you enjoyed it, Tom! Barbara is always very amusing to read. I've loved all her books. Thanks, John! Yes, it's always good to learn more about a writer you admire. NEW!! – available on Kindle! Thriller: twin girls meet by accident!